I was getting fed up with long retrieves in windy weather, digging models out of trees and wading about in lakes. A radio DT (RDT) seemed the thing. Whilst there are commercial devices that might do the job, the idea of a homebrew caught the imagination. The BMFA Free Flight Rule Book para 3.1.1 suggests.....'that a single transmission for the purposes of DT is allowed for free flight models. The rules disallow transmission on 27/35/40MHz and recommends use of the 2.4GHz frequency'. 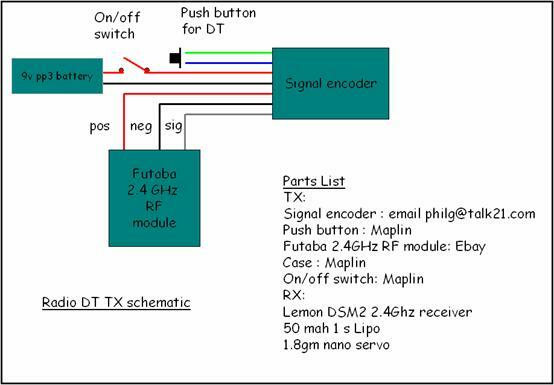 A 2.4Ghz Futaba RF module was procured (£30) together with a Phil Green encoder (£10) which supplies the relevant servo signal. An enclosure, a push button switch, an on/off power switch and a 9v pp3 completes the TX components and half an hour with a soldering iron hooks everything up. 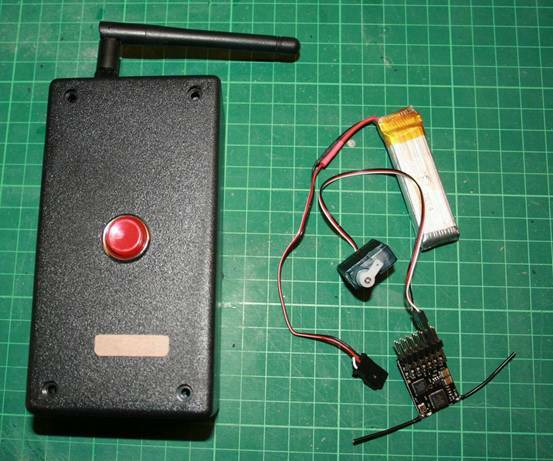 The airborne system is a Lemon DSM2 2.4Ghz receiver (£8) powered by a 50mah LiPo . This drives a 1.8gm nano servo via a mouse trap. The airborne system weighs 6-7 gm and is shown below. 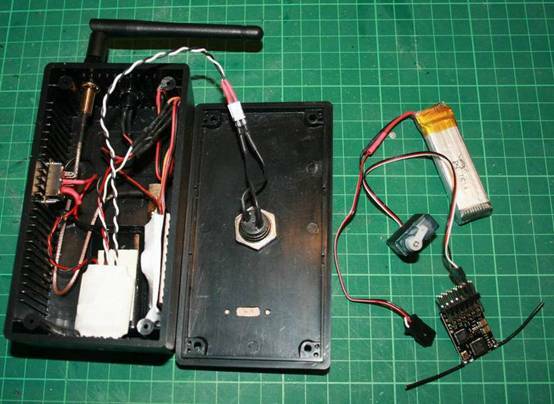 The battery shown is 120mah 1s and was replaced by a 50 mah 1s for flight testing. The system has found duty in a free flight dlg which will be tested at Luffenham at the Area events. If you are interested in this, find the PMFC flag and ask for me.